I was immediately drawn to Kathryn's emerald green dress. I was certain it was vintage but turns out it's simply retro-inspired and by local label, Maison by House of Spy. The photo does no justice to her glittery black Ron White peep toes she won in a contest (lucky girl!). She's pictured with pal, Farah, whom I should've asked about that cognac bag -- love! I finally had the pleasure of meeting the beauties behind 7 Dollar Pants. They are super sweet and of course, being style bloggers, impeccably dressed. 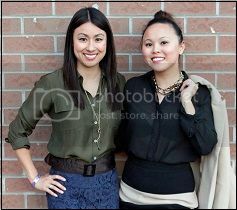 Christine (left) wears a floral printed blouse from Zara, light washed denim from H&M and Aldo for shoes and accessories. Forgetting for a moment the concept of their blog, I was convinced Julie was sporting designer everything but her entire outfit is from H&M purchased in different seasons save for the killer Topshop platforms she found at Lab Consignment. Peep their blog...bargain shoppers never looked so lovely. I slightly stalked Simone because I was in love with her chevron printed midi skirt and overall relaxed vibe. Everything she's wearing is from her frequent thrift store missions. I'm completely jealous of her finds and the fact that her total outfit is under $20. I shared some of my fave designer consignment stores via Twitter post-event. We may have a shopping date soon. Food Junkie, Stella was dressed in pops of colour and a bold print so she was hard to miss. Her bright denim is from H&M and her animal print scarf was an impulse purchase at a random Korean store. My favourite accessory of the night were her nails, which were DIY thanks to Sally Hansen Nail Effects. Recent hug contributor and writer, Daniela was classic with a twist, a girl after my own heart. Her outfit from Zara was paired with Michael Kors shoes, a great Marc Jacobs bag and vintage earrings. I loooooove the polka dots. There wasn't a gentleman in the room better dressed than Mr. Fashionights, Julio. I loved his balanced neutral ensemble featuring an Alexandar Wang tee and the most glorious Gucci loafers I've ever seen from Off The Cuff. The Louis bag doesn't hurt either, of course. Nancy was my last snap of the night, mostly because she was the poster child for my Romper Rules post from last week and looks stunning. Her jumper is from H&M and is paired with Michael Kors shoes and a chunky necklace from Courage My Love. Thanks to all these lovelies who graciously allowed me to share their hug School style with you. I hope you'll return the favour if I snap YOU at the next hug event. - Tamika Auwai is a fashion junkie, splurge-a-holic, and founder of Shop Socials.